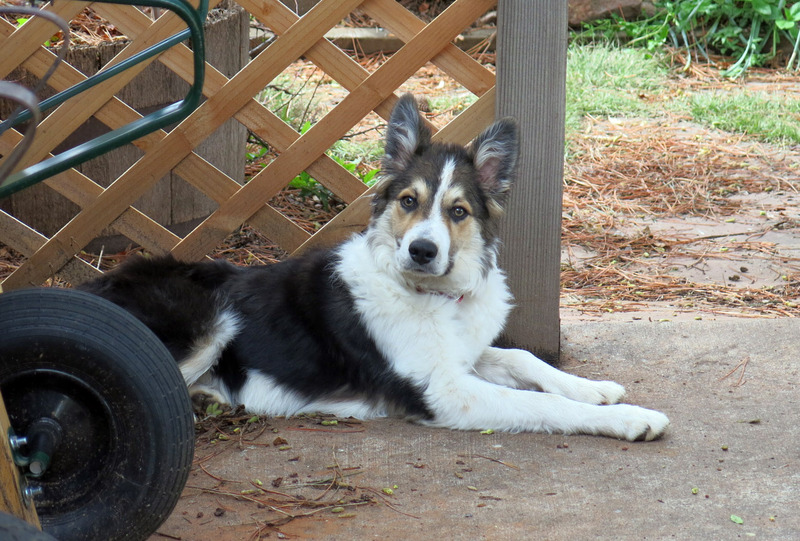 Greetings and salutations, everyone; yes, once again it is I, Mani the ever-growing, yet still tiny and cuddly, purebred border collie, filling in for the guy I live with, and here to bring you some news from our very dark and stormy garden. You may remember me from such posts as “Damp And Delighted”, among an increasingly large number of others. Here I am in a characteristic pose. This may be a bit too intellectual a pose, for some. 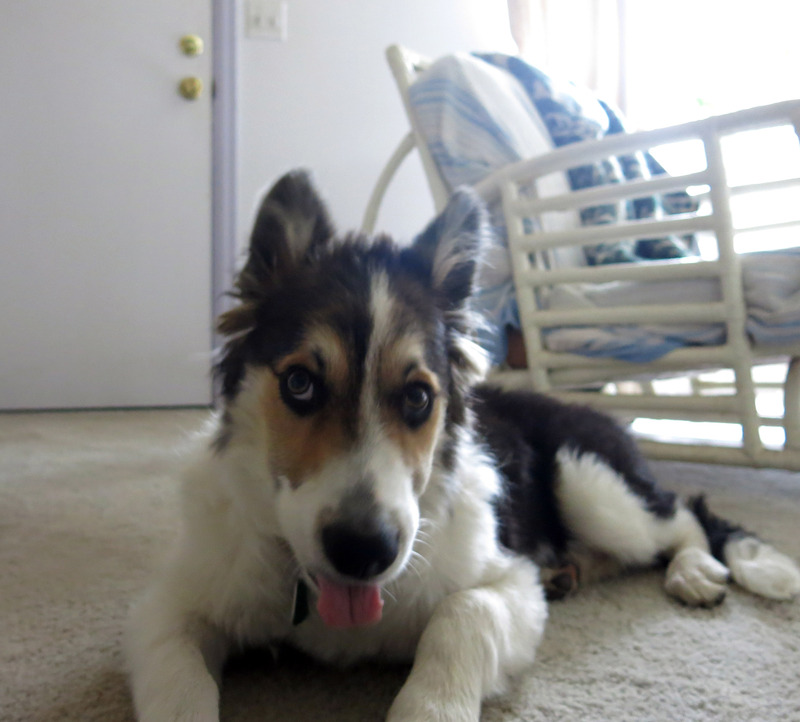 It’s entirely true that some purebred border collies can have radar ears. I mean if you didn’t already know that. Here’s my great-uncle Pooka, and you can clearly see his radar ears. I never knew him. He always looked concerned about something. Anyway, yesterday was pretty gloomy. It rained. That’s basically all it’s been doing for, like, ever. But after it stopped regular raining, without thunder and stuff, just rain, a couple of days ago, the rain now pours down, from thunderstorms. We had a few of those yesterday. With some hail. Today we saw the sun, and the guy I live with said it made him feel pretty good, on such an otherwise melancholy day, and so obviously the end was near. It turned out that it wasn’t the end, really. It was just the sun, putting in a brief appearance, just to remind us that it still exists. 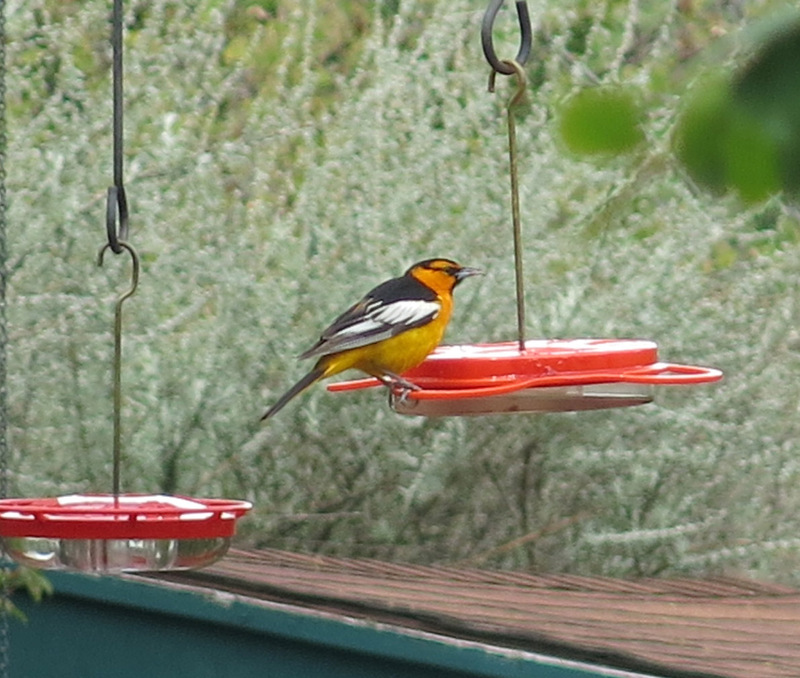 He remembered to fill the oriole feeder with grape jelly, after the rain had washed it out yesterday, and guess what happened after he did that? 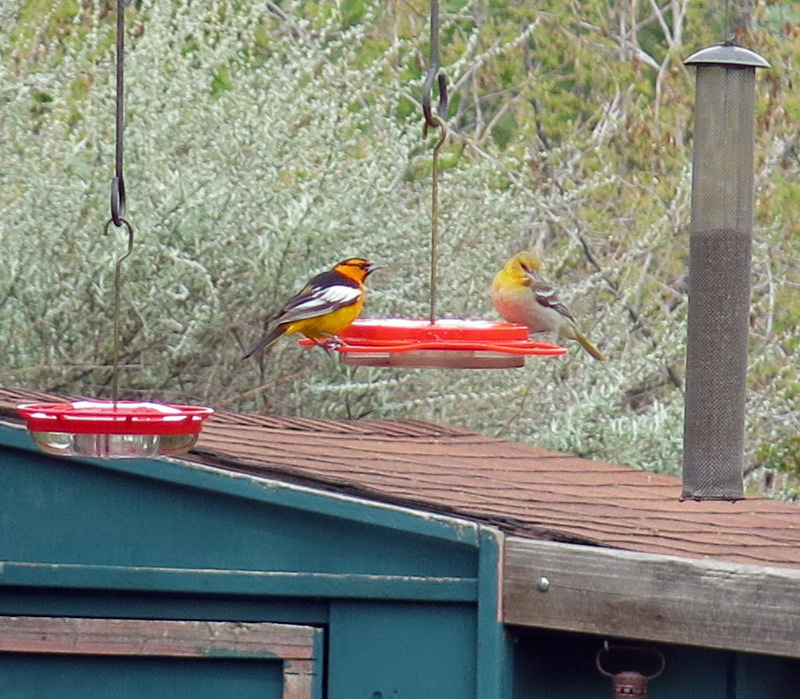 A male and a female Bullock’s oriole. The feeder has holes and a tray for sugar syrup, but bees get trapped in there, so that’s empty, unless it rains. There could be a half an orange skewered on the holder deal, but there isn’t. We don’t have any oranges. The guy I live with says he could make a list before he goes to the store, and would go there and get everything but oranges. I think it goes without saying that no gardening has been done here in about a month. Maybe a bit of this or that, but nothing serious. This is why. There are some things flowering, despite the weather. This is Ixiolirion tataricum. 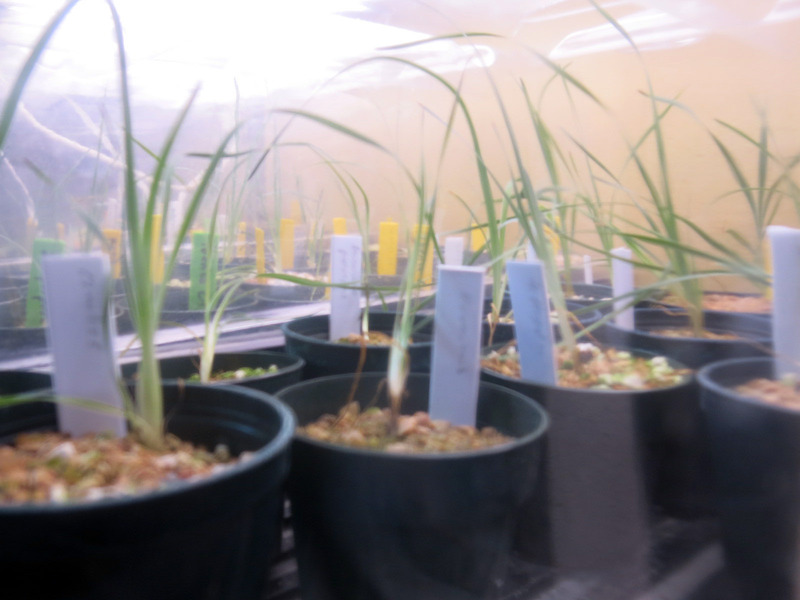 And if you were wondering how the irises were doing, I guess not too badly. I did have a bit of time this morning to patrol for squirrels, and do some other stuff, but, basically, it’s just been raining and raining. And then it rains some more. I guess I’ll leave you with that. This entry was posted in Uncategorized and tagged Bullock's oriole. Bookmark the permalink. Thanks, I am pretty huge now. Thinking about the squirrel who was sitting on the shelf, mocking me. I was thinking about you today and not expecting a post, but here is one and lovely too. I was not aware we have orioles in the west and now I want to get a supply of jelly and put it out early next year. What’s with the squirrel? Why isn’t he afraid to mock you? If he was smart he’d be a little more cautious, right? Pooka does look worried. Do you think he was worried about squirrels who have no respect? Thanks; the guy I live with said there was no reason to drag everyone else down to his level of melancholy, and, besides, there were enough negative emotions when it started to hail, again, today. He says things like we’re moving to Seattle so we can see the sun on occasion. The squirrel knows who’s the tough one around here, but he also knows I can’t climb. Yet. 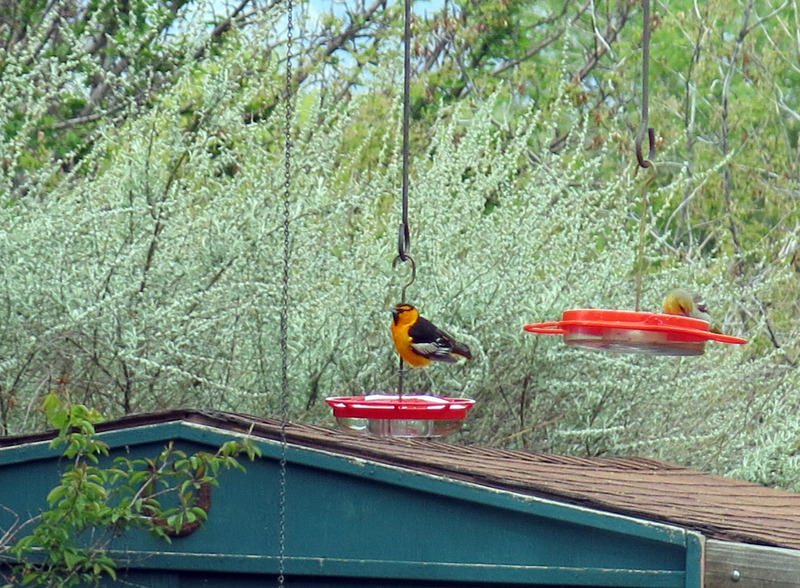 We do have orioles. Well, you can tell that. They like grape jelly the best, or at least supposedly. Bullock’s oriole is the western oriole, and I think we’re near the eastern limit of its breeding range (western Kansas and Nebraska, not exactly “near”, really). The males are more skittish than the females. Life isn’t FAIR to deliver you all that rain, Mani. But today I suspect you know that. 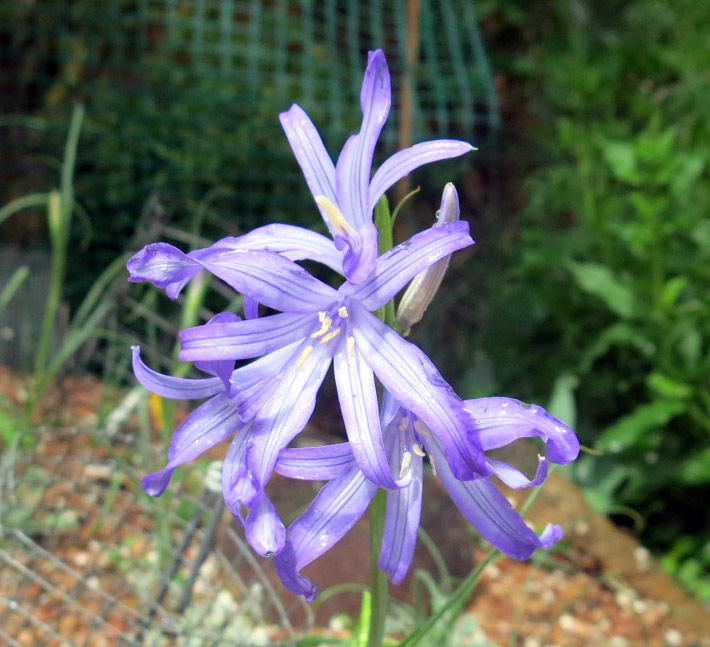 The Ixiolirion tataricum is so pretty, in color and form and just the happiness of it all. Did the guy you live with again cover his head with a trash can lid to bring us rain noise? seems loud, but then the heavens do appear to be gushing. 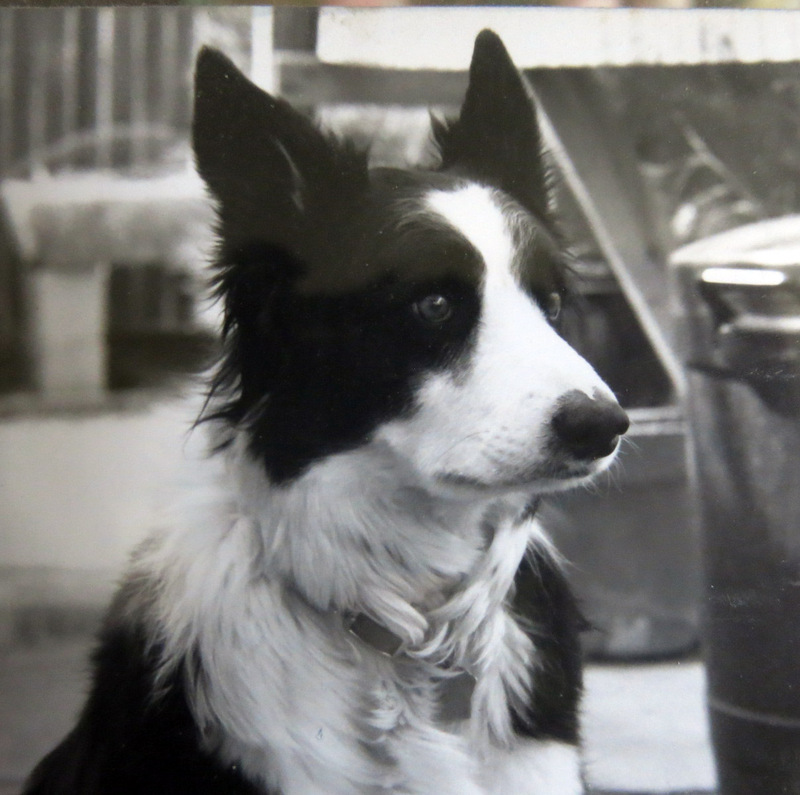 In my opinion, Uncle Pooka is an old-fashioned, serious kind of Border Collie, while you, Mani, are today’s laid-back-but-alert Border Collie. Although no less fierce than Pooka. 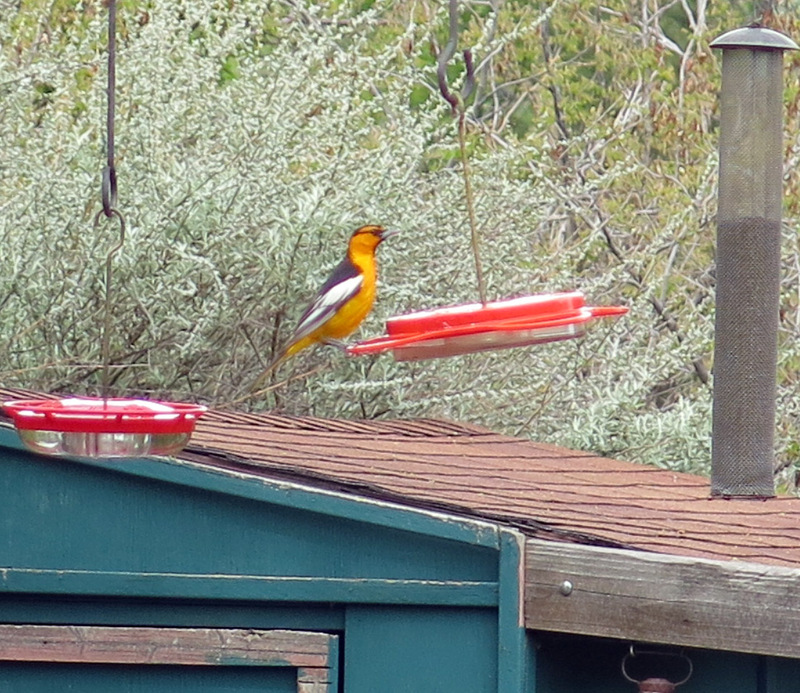 Plus, you are a mystery solver: that bird yesterday splashing in the pot fountain was an oriole. Thanks; the guy I live with says the rain isn’t fair, and you could have it all, if that were possible. No trash can lid; he was standing in the garage and used the zoom feature on the point-and-shoot. The noise was from the hail. There was a sale on Welch’s at the store and so we have a bunch of it; it goes faster than you think. Tell your guy to do something fun,it is a brand new day for him, leave yesterday behind until next time it comes around. I know there are other anniversaries ahead and we all get sad as we should. Chin up. Thanks; yesterday wasn’t so bad, except for me getting in trouble (for tinkling on the bed; I tried to point out that the border collie who lived here before me tinkled on the couch from time to time, and that we’re basically what you might call “weirdos”, but I had to stand in the corner for a few minutes). Today the sun is out, and the guy I live with says that we’re all doomed now.